An online English version of L.L. Zamenhof's original 1887 book outlining Esperanto. Handy Esperanto sentences translated into dozens of other languages. A compilation of hard-to-say Esperanto words and phrases. 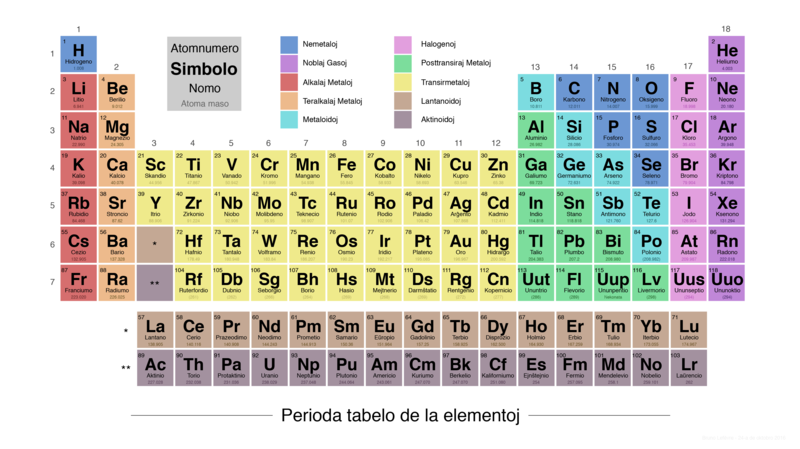 The Periodic Table of Elements translated into Esperanto. A do-it-yourself guide to the Esperanto game Frazludo, and instructions on how to play it. A comprehensive chart of hundreds of Esperanto colors. Simple Esperanto lessons and common phrases. A guide to all Esperanto grammar in simple Esperanto. The Esperanto fundementals, in Esperanto. Free ebooks to help you expand your Esperanto vocabulary. Edgar Allen Poe's The Raven translated into Esperanto. A comprehensive introduction to Esperanto. Kick off your Esperanto journey with this handy PDF course. A simple list of similar Esperanto words.